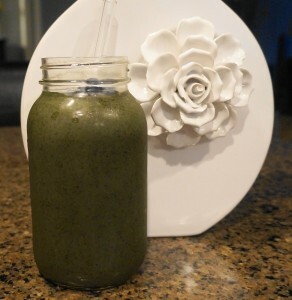 Breakfast today was a simple but energy-spiking green gem of a smoothie. Rather looks like my usual fare, doesn’t it? Well, don’t let that regular-old-green-smoothie-façade fool you! I had much-ado on the agenda today, so I wanted to be at my productive best. And yet, I didn’t want to fuss over a grocery list of ingredients. So I kept it simple. Yet powerful. Blend all ingredients, except for blueberries and chia seeds, in high-speed blender. Add blueberries and whirl until smooth. Pour into glass/container with lid. Add chia seeds; stir on and off for a few minutes. Top with lid and place in fridge until chia seeds plump up and the smoothie becomes almost pudding-like (at least 30 minutes to an hour – I went out for a dog walk in the interim). And how does this black-blue-hued bevvy fare on the nutrition scale? 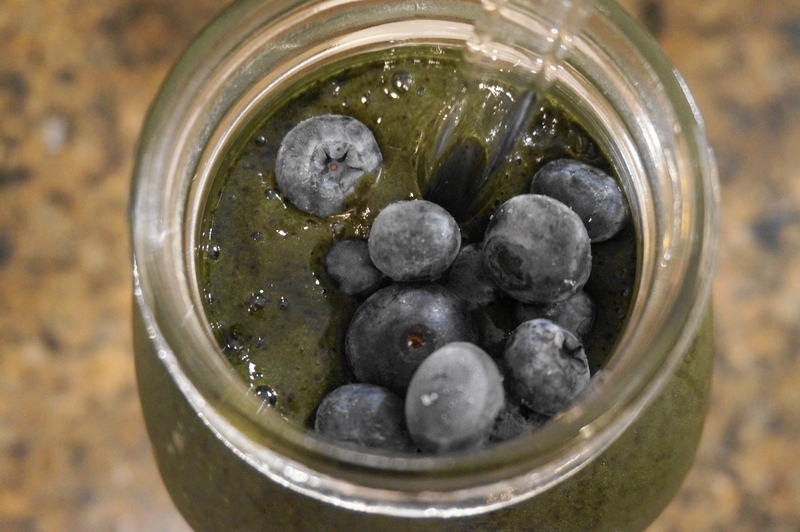 …spirulina is a protein-rich, chlorophyll-laden, blue-green algae bursting with vitamins A, B1, B2, B6, E, and K. It is the best source of gamma-linolenic acid (GLA), an anti-inflammatory essential fatty acid necessary for a healthy nervous system. …maca – the highest-altitude crop on Earth – is an adaptogenic superfood that increases energy, endurance, oxygen in the blood, physical strength, neurotransmitter production, and libido. It supports healthy hormone production and supports the thyroid, adrenals, and endocrine system. …cinnamon has tremendous medicinal and healing properties, and is an excellent source of manganese, chromium, iron, calcium and fiber. It cleans and detoxifies the body, regulates blood sugar levels. and boosts the immune system. …chia seeds are incredibly nutrient-dense and fiber-filled, providing ample protein, manganese, magnesium, calcium, and phosphorous. Chia seeds offer substantial omega-3 essential fatty acids, supporting both heart and brain, and reducing inflammation. They help keep blood sugar in check, and provide a steady flow of energy throughout the day. …leafy greens are nutritional powerhouses, offering an abundance of vitamins A, K, C and E, and plentiful minerals like iron, calcium, potassium and magnesium. Dark leafies provide fiber, protein, and even small amounts of omega-3’s. …blueberries are fiber-dense, very rich in antioxidants, vitamins A, the B’s, C, and E, antibacterial copper, selenium, iron, and zinc. The antioxidants fight free radicals that cause aging and disease, and boost immunity. Blueberries help prevent urinary tract infection, preserve vision, and promote brain and heart health. Julia, sounds yummy and powerhouse-full. Have to admit a scrunched-up face when considering stevia drops, but the fresh stevia leaves from the happy little plant growing in my garden? That’s delicious! Thank you for the wonderfully inspiring blogs to this Vitamix newbie! Hi Judy – It is terrific to hear from you! Yes, I am planning to grow my own stevia in the Spring, and sun-dry or dehydrate myself for use throughout the year. Minimal processing and control over any potential additives (that some companies are wont to do!). And, the opportunity to flourish from the natural health benefits of this plant. I’m glad you are enjoying my blog…and your Vitamix. Yahoo!